Let’s compare two politicians, Senator Elizabeth Warren of Massachusetts and Congressman Jeb Hensarling of Texas, to see which one actually has the courage to fight against powerful interest groups. We’ll start with Senator Warren. She portrays herself as the scourge of Wall Street, but it appears that the Massachusetts lawmaker isn’t merely a fake Indian, she’s also a fake opponent of corporate welfare. Kevin Williamson of National Review has some withering criticism of Senator Warren’s faux populism. Senator Elizabeth Warren, the millionaire Massachusetts class warrior who has made the vilification of Wall Street bankers her second-favorite pastime (right behind prospering on the largesse of Wall Street lawyers, the gentlemen and scholars who funded her very generously compensated position at Harvard and fill her campaign coffers) did not exactly make the issue her hill to die on, but the fight did provide her an excellent opportunity for grandstanding. …Senator Warren did her usual dishonest shtick, engaging in her habitual demagoguery without every making an attempt to actually explain the issue, which is a slightly complicated and technical one, to the rubes who make up the Democrats’ base. …This led Maggie Haberman of Politico to admire Senator Warren’s “authenticity,” the choice of precisely that word being the cherry on this sundae of asininity. Senator Warren is as much an authentic champion of ordinary working people as she is an authentic Cherokee princess — and Mel Brooks and those Yiddish-speaking Indians from Blazing Saddles were more convincing in that role. But the problem is much deeper than empty grandstanding. Senator Warren wants to give government more power, which will exacerbate the problem. Many on the Tea Party right and the Occupy left intuit that there exists a dysfunctional relationship between Wall Street and Washington, though Senator Warren et al. maddeningly believe that the way to ameliorate this is to invest Washington with even greater powers, enabling even worse misbehavior and even more remorseless rent-seeking. And let’s not forget the left’s historical revisionism. Here’s how the New York Times relates the cromnibus skirmish to bailout politics: “The liberal base of the Democratic Party, led by Ms. Warren, also found itself in an unlikely alliance with the Tea Party wing of the Republican Party. Both opposed the Wall Street bailout of 2008 and feared that the spending measure would not only provide a bounty for big banks but would also help cause another economic crisis.” …One wonders which of these famous progressives the New York Times has in mind when it states — as uncontested fact — that “the liberal base of the Democratic party” “opposed the Wall Street bailout of 2008.” …The bailouts were enabled by the Emergency Economic Stabilization Act of 2008, which enjoyed the support and votes of Senator Barack Obama of Illinois, Senator Joe Biden of Delaware, Senator Hillary Rodham Clinton of New York, Speaker of the House Nancy Pelosi, Senator Charles Schumer of New York, Representative Barney Frank of Massachusetts, Senator Patrick Leahy of Vermont, Representative Jesse Jackson of Illinois, Representative Sheila Jackson Lee of Texas, etc. The people who actually opposed bailouts by voting against bailouts were not in the main progressives, but were disproportionately conservative Republicans: Representative Michele Bachmann of Minnesota, Representative Michael Burgess of Texas, Representative Jeff Flake of Arizona, Senator Sam Brownback of Kansas, Senator Jim DeMint of South Carolina, etc. Elizabeth Warren was a high-paid Harvard professor in 2008, so we don’t know how she would have voted on TARP. But based on her current support for bailouts, handouts, and subsidies for big companies (including support for the egregious Export-Import Bank), she probably would have voted yes. The Tea Party came into being as a reaction to Republican complicity in bailouts of all sorts: of Wall Street firms, and of irresponsible mortgage borrowers. Occupy, and the potty-trained version of that movement led by Elizabeth Warren, demands more bailouts: of people who borrowed money for college or to buy a home, of fashionable corporations that do not want to pay market rates for financing, etc. Senator Warren is an energetic proponent of corporate welfare for Boeing, General Electric Bechtel, Caterpillar, and other such poor, defenseless little mom-and-pop operations. If you are looking for actual rather than theoretical opposition to bailouts and corporate welfare, then your choices include Senator Rand Paul and Senator Ted Cruz, but practically nobody who might be called a progressive. In other words, politicians like Senator Warren pay lip service to the notion that big government shouldn’t be in bed with big business. But when it’s time to cast votes, she’s a reliable supporter of cronyism. Now let’s review a politician who talks the talk but also walks the walk. Here are some excerpts from Kimberley Strassel’s Wall Street Journal profile of Congressman Hensarling. Rep. Jeb Hensarling…has spent a decade riding herd on cronyists who give capitalism a bad name by giving or taking special government favors. …Washington’s Lone Ranger was at it again this week in the fight over reauthorizing the Terrorism Risk Insurance Program, a “temporary” program created in 2002 that requires taxpayers to absorb the costs of insurance payouts after an attack. …The Texan didn’t get all the reforms he wanted in the reauthorization bill that did pass this week, but he got some. Kudos to the Congressman for arguing that companies should pay market prices for insurance rather than shifting some of the liability to taxpayers. But that’s just one example of his fight against cronyism. He’s also fighting to protect taxpayers against the predations of Fannie Mae and Freddie Mac. The congressman stepped down from the House leadership after the 2012 election to become chairman of the House Financial Services Committee, where he could be at the center of restoring what he calls the “bedrock” GOP principle of “free enterprise.” From that perch, Mr. Hensarling has doggedly worked to dismantle crony government programs that reward the well-connected business elite. …Take his longtime fight to eliminate Fannie Mae and Freddie Mac, the government-backed housing giants that were central to the 2008 crash. Mr. Hensarling has yet to get a House vote on his proposal, though this focus has helped put uncomfortable attention on those pushing only watered-down reform. Earlier this year, he led a battle against plans to roll back reforms to the federal flood-insurance program. The House passed that atrocity, but only after former Majority Leader Eric Cantor (to great outrage) did the insurance lobby’s bidding and bypassed Mr. Hensarling on the way to a vote. …This fall he provoked a debate over reauthorization of the Export-Import Bank, which exists to provide cheap financing for select industry players. 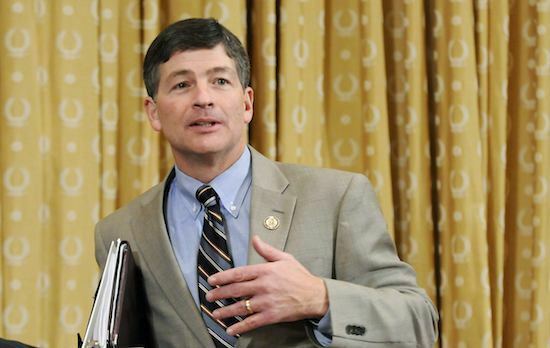 …The House instead caved and threw Ex-Im reauthorization into a September funding bill, though Mr. Hensarling was able to limit its extension to June—when he intends to have that fight all over again. Let’s hope Hensarling prevails over Warren next year and the Export-Import Bank no longer is allowed to feed at the public trough. A key question is whether other Republicans will be willing to join Congressman Hensarling’s fight. Such fights in the next Congress will be even more worth watching. …The K-Street lobbyists are about to put enormous pressure on Republicans. …All eyes are now on the GOP. Republicans are happy to criticize obvious (and Obama -backed) recipients of government largess: the Solyndras of the world. Yet few have been willing to shut down larger programs that pay off entire industries and send dollars back to their state businesses. This is why many voters see the GOP as the party of the “rich and powerful” and Democrats get traction with their populist catchphrases. …Democrats are the ones who are champions of big government, which exists to reward the politically connected, and to hide those rewards within legislation and backroom bureaucratic payoffs. …The GOP has a yawning opening to make this case, and position itself as the party that truly represents Main Street. If past behavior is any indication of future behavior, there are some very discouraging reasons (here, here, here, and here) to think Republicans will side with K Street over taxpayers. But maybe GOPers will surprise us and do what’s best for America rather than what’s best for corporate moochers. P.S. If you want some serious analysis of Elizabeth Warren’s class-warfare agenda, click here. And if you want some amusing satire about her attack on entrepreneurs, click here. P.P.P.S. 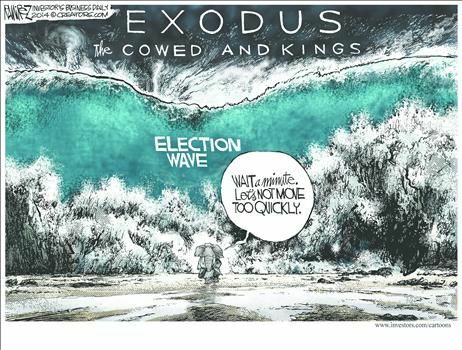 Based on this cartoon, Michael Ramirez isn’t very optimistic on whether the GOP will have the backbone necessary to fight cronyism and special-interest corruption. And this Ramirez cartoon about GOP timidity is an instant classic, sort of like the one he did on the Republican elephant in the Garden of Eden. 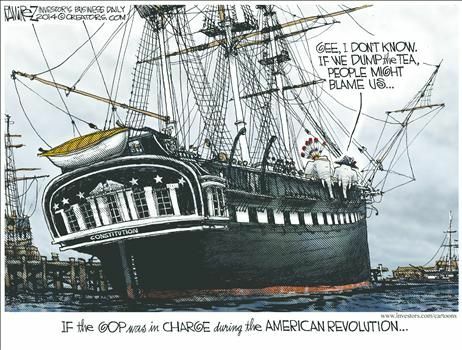 If I do an update of my post on best political cartoons, this will definitely get added.